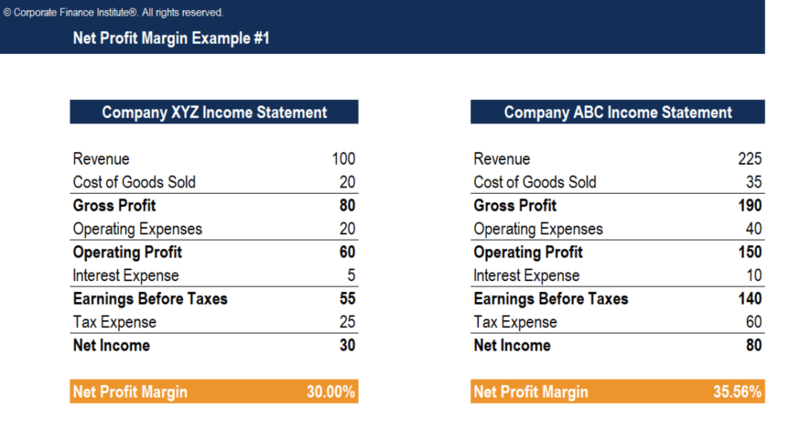 This Net Profit Margin template will show you how to calculate the net profit margin using a company’s income statement line items. Net Profit Margin (also known as “Profit Margin” or “Net Profit Margin Ratio”) is a financial ratioFinancial RatiosFinancial ratios are created with the use of numerical values taken from financial statements to gain meaningful information about a company. The numbers found on a company’s financial statements – balance sheet, income statement, and cash flow statement are used to perform quantitative analysis and assess a company's liquidity, leverage, growth used to calculate the percentage of profit a company produces from its total revenue. It measures the amount of net profit a company obtains per dollar of revenue gained. The net profit margin is equal to net profit (also known as net income)Net IncomeNet Income is a key line item, not only in the income statement, but in all three core financial statements. While it is arrived at through the income statement, the net profit is also used in both the balance sheet and the cash flow statement. divided by total revenueSales RevenueSales revenue is the starting point of the income statement. Sales or revenue is the money earned from the company providing its goods or services, income, expressed as a percentage. Net profitNet IncomeNet Income is a key line item, not only in the income statement, but in all three core financial statements. While it is arrived at through the income statement, the net profit is also used in both the balance sheet and the cash flow statement. is calculated by deducting all company expenses from its total revenue. The result of the profit margin calculation is a percentage – for example, a 10% profit marginProfit MarginIn accounting and finance, profit margin is a measure of a company's earnings relative to its revenue. The three main profit margin metrics are gross profit (total revenue minus cost of goods sold (COGS) ), operating profit (revenue minus COGS and operating expenses), and net profit (revenue minus all expenses) means for each $1 of revenue the company earns $0.10 in net profit. Revenue represents the total sales of the company in a period.